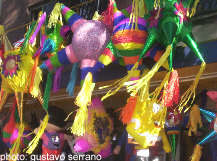 I t's Christmas time, and December events in San Miguel de Allende sparkle with color and tinsel, piñatas and posadas, high mass and low comedy. Many Mexicans get a longish vacation at Christmas, and though the beaches are the first choice of venue for many, a whole slew of them choose to spend the holidays in San Miguel. It's wise to make room reservations well in advance. Most December events in San Miguel de Allende center around Christmas and its related celebrations, but there are a few others to enjoy as well. 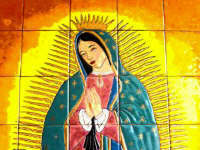 December 12 - Feast of the Virgin of Guadalupe. The most famous and beloved icon in all Mexico, the Virgin of Guadalupe is the patron saint of the country and the "Empress of Latin America." To Mexicans, she is The Mother. You will never enter a Catholic church in Mexico without finding her portrait somewhere. This is her story: In 1531, an indigenous man, Juan Diego, was on his way to church when the Virgin appeared to him on Tepayac Hill, near Mexico City. She instructed him to tell the bishop to build her a church on that spot. But poor Juan, being only an Indian, could not convince the bishop he was telling the truth. So the Virgin appeared to him again. At her feet, Spanish roses grew, even though it was winter. She told him to wrap them in his cloak and take them to the bishop as proof of the miracle. When he spilled the roses at the bishop's feet, the brown-skinned Virgin's image had been imprinted on the cloak—which is now in the Basilica of the Virgin of Guadalupe that stands on Tepayac Hill. In San Miguel, a large banner image of the Virgin is mounted over the gate in front of the Parroquia. Late on the evening of the 11th, the mariachis gather before the image. At the stroke of midnight, they serenade her with "Las Mañanitas" the Mexican Happy Birthday song. A highlight of the day is a children's procession. It usually begins with a float featuring a young woman dressed as the famous icon of the virgin and a boy as Juan Diego at her feet. Other children in the procession will dress up as campesinos, perhaps with a mustache drawn on and a poncho festuring the image of the virgin. The procession ends at the Jardin. Though the holiday is December 12th, the procession may be a day or two earlier. Check the calendar in Atencion for exact times. This day holds a special pleasure for me. I first arrived in San Miguel de Allende on December 12, 1989. I marveled at the decorated altars all over town. That night, I sat on the steps in front of the Parroquia and watched my first castillo fireworks. I was enchanted. I still am. So, much as I love christmas, today is one of my favorite December events in San Miguel de Allende. Guadalupe day also unofficially inaugurates the Christmas season in San Miguel. It's a season of fiestas, music, performances, fiestas, parades, good food and drink and... oh, did we mention fiestas? Every neighborhood will have its special Fiesta de Navidad, but the city also puts on many events. Last Two Weeks in December - Festival de San Miguel: Chamber Music Festival. Begun in 1987, the Festival de San Miguel is the second chamber music festival of the year. It's been recognized by the Mexican government as the country's best classical music festival. In 2007, the Festival runs December 20-31 at the Angela Peralta Theater. Tickets are reasonably priced and three of the regular concerts will be free. There will also be a free concert for children presenting "Peter & the Wolf," with narration in Spanish. For more information, visit the Festival de San Miguel website. Christmas Season - To give you an idea of what to expect in the way of Christmas celebrations, here's a list of Christmas Activites in San Miguel de Allende for 2009. December 16-24 - Las Posadas. Not one event, but a string of December events in San Miguel de Allende, the nine nights of the posadas—which means "inn"—represent the nine-day journey of Mary and Joseph to Bethlehem. In a different colonia each night, a boy dressed as Joseph and a young girl dressed as Mary (usually riding donkey) parade through the streets knocking on doors only to be turned away because there is "no room at the inn." After all, sings the household, "you might be a rogue." At each door, they sing the traditional Posada Song, "Pidiendo Posada," (Begging for Shelter). Learn all the lyrics to the Posada Song here. There's even a sound link to listen to the tune itself if you don't know it. Finally, the Holy Couple finds an open door and a welcome, and everyone is offered food and hot fruit ponche to drink. Piñatas get broken and candy gobbled. Try this ponche recipe yourself. It's a true Mexican taste of Christmas. Pastorelas are another highlight of this period. These passion plays mix spirituality with high spirits, often with flying angels and evil devils getting their due. Broad satire often lampoons political figures. There is usually a wonderful pastorela at Bellas Artes. December 24 - Noche Buena - Christmas Eve. Tonight is actually more important to Mexicans than Christmas Day. 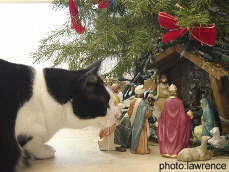 During the day, a life-size manger is set up in the center of the Jardín, complete with live lambs and a burro. The last posada of the season passes by here in early evening, then everyone goes home to get ready for the party. And like any good Mexican party, it goes on most of the night. After going to midnight mass, Mexican families sit down to a feast, often a traditional meal of bacalao, a salt cod dish I've personally decided you have to grow up with to enjoy. Afterward, everyone opens their gifts, though the children's main presents will be kept until Three Kings' Day, Day of the Epiphany, on January 6th. Note: Most restaurants will be closed tonight so that staff can enjoy the evening with their own families. If you need to eat out, plan accordingly. December 25 - Día de Navidad, Christmas Day. If yesterday was for family, today is for going to church, then promenading through the streets and meeting friends. It's a much more low-key day than folks from the U.S. and Canada are used to, but still a lively and joyous December event in San Miguel de Allende. December 28 - Dia de los Santos Inocentes, day of the Holy Innocents. This day commemorates the day Herod sent out his troops to slaughter all male children under two years old, in hopes of catching and killing the newborn King he heard had been born in Bethlehem. But despite its bloody historical basis, it's a day of fun and jokes—Jesus did escape, after all. Mexicans play elaborate practical jokes on each other today. If you fall for one, you'll hear the cry of "Inocente! Inocente! "—roughly equivalent to being called an April Fool in the U.S.
December 31 - New Year's Eve. One of the most festive nights of the year. Everyone comes out. The Jardín is jam-packed. Bars are hopping. Music seems to poor out of every door and window. Don't plan to eat anywhere fancy without reservations. At midnight tonight, Mexicans will eat 12 grapes as a talisman for luck in the twelve months of the coming year. Tonight offers up one of the more impressive fireworks displays of the year. It's the last and one of the best December events in San Miguel de Allende. As the year ends, it's wonderful to just take a moment to look around and be thankful you're in this magical Mexican paradise.